Our 2019 calendar celebrates the legacy of great strikes, from the Seattle and Winnipeg general strikes of 100 years ago to the wave of teachers’ strikes last year that gave renewed hope to a U.S. labor movement that has suffered decades of defeats and retrenchment, and to millions of workers struggling to survive. 14 photos, and more than a thousand notes. Published annually since 1985. We welcome suggestions of important dates in labor history around the world, and especially information about photos that should be considered for inclusion. This standard 11-by-17 wall calendar features a scene from rail labor history each month plus more than 150 historic dates of significance to railroad workers over the last century and a half of struggle. $15 each, free shipping. The Rail Workers Labor History Calendar is produced with Railroad Workers United, and benefits their work organizing railroad worker solidarity across craft lines and other borders. It is printed by union labor. Bulk rates are available. You can order copies directly from Railroad Workers United (site includes rates for bulk orders), or order single copies from the Hungarian Literature Fund by clicking here. 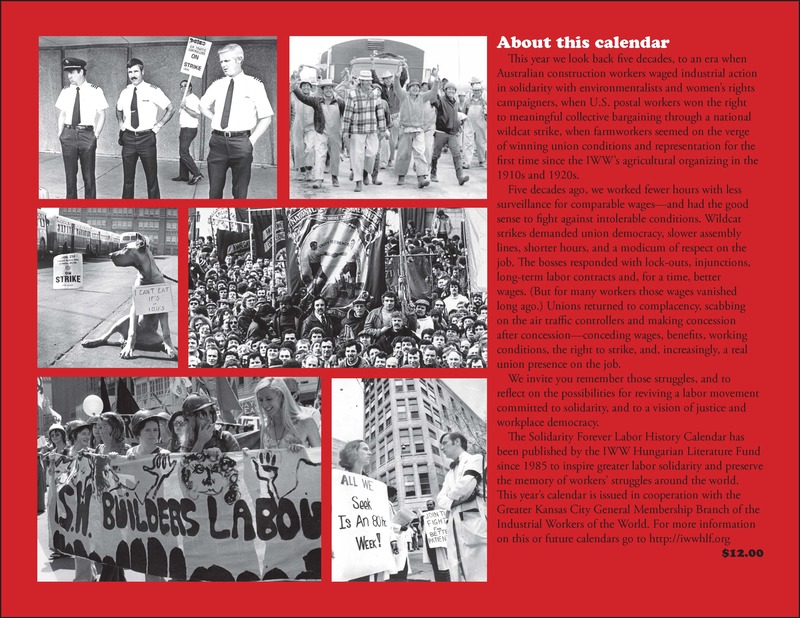 We have produced two calendars for 2018: one marks railroad workers’ struggles (proceeds support the work of Railroad Workers United), and our normal Solidarity Forever Labor History calendar – this time marking labor struggles against fascism and bigotry with 14 photos, hundreds of commemorative notes, and an essay on the role unions have played in this vital struggle. Both open to 11 by 17, and are printed by union labor. 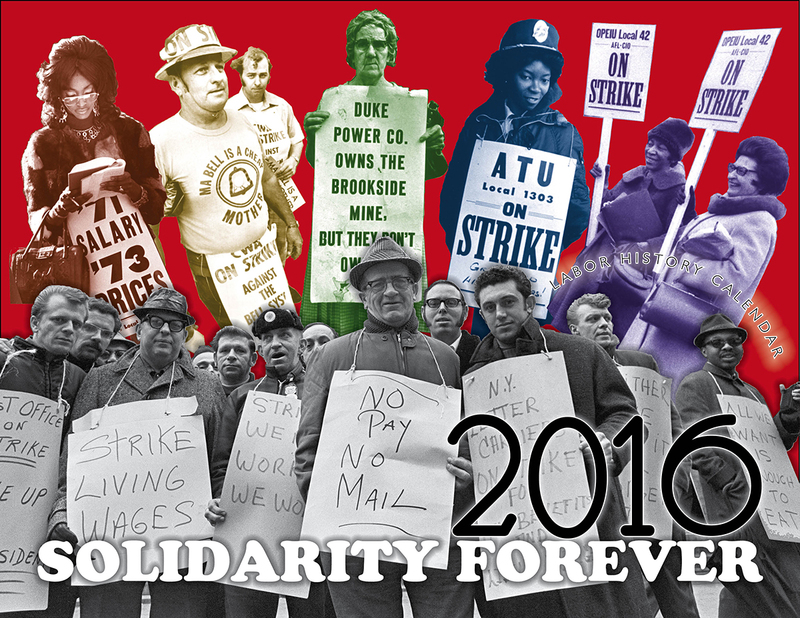 The 2017 Solidarity Forever Labor History Calendar is now in its third printing. The retail price remains at $12, post-paid to US and Canada. A bundle of 5 copies to the same address is $36. Those interested in large quantities should contact us at iwwhlf@gmail.com. May 1916 marked the centenary of the execution of IWW/labor organizer James Connolly by British authorities for his role in leading the Easter Rebellion. The IWW Hungarian Literature Fund is commemorating the occasion by publishing a graphic history of his life by veteran comic artist Tom Keough, followed by a modest selection of Connolly’s writings and an afterword by labor historian (and editor of the graphic history The Wobblies) Paul Buhle. Ordering information and more details are available on our Connolly page. 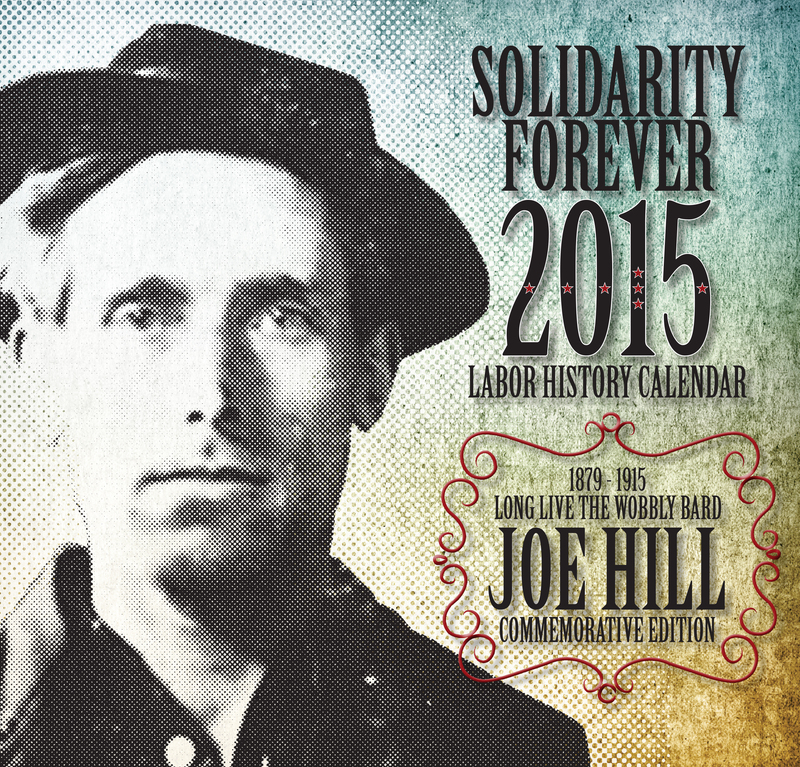 The 2016 labor history calendar is out of print. We returned to the smaller 11 by 17 format for 2016, and restored the price to $12, $6.50 each for orders of 5 or more copies (ask for rates for orders of 25 copies or more). It is produced in cooperation with the Greater Kansas City General Membership Branch of the IWW. Work is beginning on the 2017 edition of the calendar. In March 2016, the Hungarian Literature Fund will co-release James Connolly: A Full Life, a graphic novella by Tom Keough issued on the centenary of the Easter Rising. The web site also has a page for purchasing a Joe Hill commemorative t-shirt and other items, a chronology of major events in Joe Hill’s life, etc. ; it is continuously being updated. 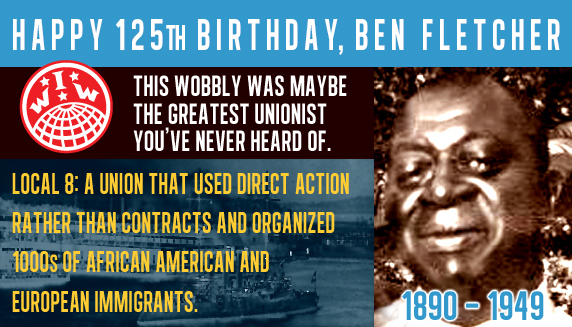 Monday, April 13, is the 125th anniversary of the birth of the great African-American IWW organizer Ben Fletcher, who organized Philadelphia dockworkers into the country’s first integrated longshore union. IWW Hungarian Literature Fund trustee and former IWW General Executive Board Chairman Fred Lee has died. FW Lee liberated the last of Joe Hill’s ashes from federal custody, played a central role in reviving the IWW in the British Isles, and was a renowned heterodox economist who worked relentlessly to break the stranglehold of pro-capitalist orthodoxy.